A dandelion flower head composed of numerous small florets (top). The seedhead is shown below it. Taraxacum (/təˈræksəkʊm/) is a large genus of flowering plants in the family Asteraceae, which consists of species commonly known as dandelions. The genus is native to Eurasia and North America, but the two commonplace species worldwide, T. officinale and T. erythrospermum, were introduced from Europe and now propagate as wildflowers. Both species are edible in their entirety. The common name dandelion (/ˈdændɪlaɪ.ən/ DAN-di-ly-ən, from French dent-de-lion, meaning "lion's tooth") is given to members of the genus. Like other members of the Asteraceae family, they have very small flowers collected together into a composite flower head. Each single flower in a head is called a floret. In part due to their abundance along with being a generalist species, dandelions are one of the most vital early spring nectar sources for a wide host of pollinators. Many Taraxacum species produce seeds asexually by apomixis, where the seeds are produced without pollination, resulting in offspring that are genetically identical to the parent plant. The species of Taraxacum are tap-rooted, perennial, herbaceous plants, native to temperate areas of the Northern Hemisphere. The genus contains many species, which usually (or in the case of triploids, obligately) reproduce by apomixis, resulting in many local populations and endemism. In the British Isles alone, 234 microspecies are recognised in 9 loosely defined sections, of which 40 are "probably endemic". 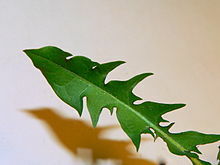 In general, the leaves are 5–25 cm long or longer, simple, lobed, and form a basal rosette above the central taproot. The flower heads are yellow to orange coloured, and are open in the daytime, but closed at night. The heads are borne singly on a hollow stem (scape) that is usually leafless and rises 1–10 cm or more above the leaves. Stems and leaves exude a white, milky latex when broken. A rosette may produce several flowering stems at a time. The flower heads are 2–5 cm in diameter and consist entirely of ray florets. 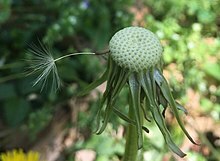 The flower heads mature into spherical seed heads called blowballs or clocks (in both British and American English) containing many single-seeded fruits called achenes. Each achene is attached to a pappus of fine hairs, which enable wind-aided dispersal over long distances. The flower head is surrounded by bracts (sometimes mistakenly called sepals) in two series. The inner bracts are erect until the seeds mature, then flex downward to allow the seeds to disperse. The outer bracts are often reflexed downward, but remain appressed in plants of the sections Palustria and Spectabilia. Some species drop the parachute from the achenes; the hair-like parachutes are called pappus, and they are modified sepals. Between the pappus and the achene is a stalk called a beak, which elongates as the fruit matures. The beak breaks off from the achene quite easily, separating the seed from the parachute. A number of species of Taraxacum are seed-dispersed ruderals that rapidly colonize disturbed soil, especially the common dandelion (T. officinale), which has been introduced over much of the temperate world. After flowering is finished, the dandelion flower head dries out for a day or two. The dried petals and stamens drop off, the bracts reflex (curve backwards), and the parachute ball opens into a full sphere. When development is complete, the mature seeds are attached to white, fluffy "parachutes" which easily detach from the seed head, glide by wind, and disperse. Hawksbeard flower heads and ripe seeds are sometimes confused with dandelions. 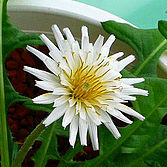 Many similar plants in the Asteraceae family with yellow flowers are sometimes known as false dandelions. Dandelion flowers are very similar to those of cat's ears (Hypochaeris). Both plants carry similar flowers, which form into windborne seeds. However, dandelion flowers are borne singly on unbranched, hairless and leafless, hollow stems, while catsear flowering stems are branched, solid, and carry bracts. Both plants have a basal rosette of leaves and a central taproot. However, the leaves of dandelions are smooth or glabrous, whereas those of catsears are coarsely hairy. Early-flowering dandelions may be distinguished from coltsfoot (Tussilago farfara) by their basal rosette of leaves, their lack of disc florets, and the absence of scales on the flowering stem. 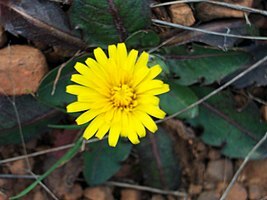 Other plants with superficially similar flowers include hawkweeds (Hieracium) and hawksbeards (Crepis). These are readily distinguished by branched flowering stems, which are usually hairy and bear leaves. The genus is taxonomically complex, with some botanists dividing the group into about 34 macrospecies, and about 2000 microspecies; about 235 apomictic and polyploid microspecies have been recorded in Great Britain and Ireland. Some botanists take a much narrower view and only accept a total of about 60 species. Taraxacum officinale (syn. T. officinale subsp. vulgare), common dandelion. Found in many forms. 'Amélioré à Coeur Plein' yields an abundant crop without taking up much ground, and tends to blanch itself naturally, due to its clumping growth habit. 'Broad-leaved' - The leaves are thick and tender and easily blanched. In rich soils, they can be up to 60 cm wide. Plants do not go to seed as quickly as French types. 'Vert de Montmagny' is a large-leaved, vigorous grower, which matures early. Dandelions are thought to have evolved about 30 million years ago in Eurasia. Fossil seeds of Taraxacum tanaiticum have been recorded from the Pliocene of southern Russia. Dandelions have been used by humans for food and as an herb for much of recorded history. They were well known to ancient Egyptians, Greeks and Romans, and have been used in Chinese traditional medicine for over a thousand years. Dandelions probably arrived in North America on the Mayflower—not as stowaways, but brought on purpose for their medicinal benefits. Despite its useful properties, the dandelion is commonly regarded as a weed, as a result of the rise of lawn culture and marketing by herbicide companies. The Latin name Taraxacum originates in medieval Persian writings on pharmacy. The Persian scientist Al-Razi around 900 CE wrote "the tarashaquq is like chicory". The Persian scientist and philosopher Ibn Sīnā around 1000 CE wrote a book chapter on Taraxacum. Gerard of Cremona, in translating Arabic to Latin around 1170, spelled it tarasacon. The English name, dandelion, is a corruption of the French dent de lion meaning "lion's tooth", referring to the coarsely toothed leaves. The plant is also known as blowball, cankerwort, doon-head-clock, witch's gowan, milk witch, lion's-tooth, yellow-gowan, Irish daisy, monks-head, priest's-crown, and puff-ball; other common names include faceclock, pee-a-bed, wet-a-bed, swine's snout, white endive, and wild endive. The English folk name "piss-a-bed" (and indeed the equivalent contemporary French pissenlit) refers to the strong diuretic effect of the plant's roots. In various northeastern Italian dialects, the plant is known as pisacan ("dog pisses"), because they are found at the side of pavements. In Swedish, it is called maskros (worm rose) after the small insects (thrips) usually present in the flowers. In Finnish and Estonian, the names (voikukka, võilill) translate as butter flower, due to the color of the flower. In Lithuanian, it is known as "Pienė", meaning "milky", because of the white latex that is produced when the stems are cut. The Welsh (dant-y-llew), German (Löwenzahn), Norwegian (løvetann) and Spanish (diente de león) names mean the same as the French and the English names. 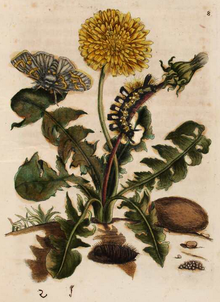 1679 hand coloured print by Maria Sibylla Merian of a dandelion as plant host to the pale tussock moth. The entire plant, including the leaves, stems, flowers, and roots, is edible and nutritious. Dandelions are found on 6 continents and have been gathered for food since prehistory, but the varieties commercially cultivated for consumption are mainly native to Eurasia and North America. A perennial plant, its leaves grow back if the taproot is left intact. To make leaves more palatable, they are often blanched to remove bitterness, or sauteed in the same way as spinach. Dandelion leaves and buds have been a part of traditional Kashmiri cuisine, Albanian cuisine, Slovenian, Sephardic, Chinese, Greek cuisine (χόρτα) and Korean cuisines. In Crete, the leaves of a variety called 'Mari' (Μαρί), 'Mariaki' (Μαριάκι), or 'Koproradiko' (Κοπροράδικο) are eaten by locals, either raw or boiled, in salads. T. megalorhizon, a species endemic to Crete, is eaten in the same way; it is found only at high altitudes (1000 to 1600 m) and in fallow sites, and is called pentaramia (πενταράμια) or agrioradiko (αγριοράδικο). 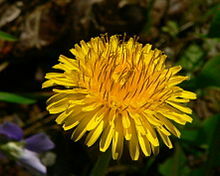 The flower petals, along with other ingredients, usually including citrus, are used to make dandelion wine. The ground, roasted roots can be used as a caffeine-free dandelion coffee. Dandelion was also traditionally used to make the traditional British soft drink dandelion and burdock, and is one of the ingredients of root beer. Dandelions were once considered delicacies by the Victorian gentry, who used them mostly in salads and sandwiches. The flowers of dandelions are typically eaten before they start to become seed heads, as although the fluffy "parachutes" are edible they are tasteless and their texture is considered unpleasant. Dandelion leaves contain abundant vitamins and minerals, especially vitamins A, C, and K, and are good sources of calcium, potassium, iron, and manganese. The raw flowers contain high levels of polyphenols and antioxidants, and are anti-inflammatory and anti-angiogenic. Historically, dandelion was prized for a variety of medicinal properties, and it contains a number of pharmacologically active compounds. Dandelion is used as a herbal remedy in Europe, North America, and China. It has been used in herbal medicine to treat infections, bile and liver problems, and as a diuretic. Dandelion has been used as a medicinal plant for thousands of years to treat inflammation, swollen lymph nodes, cysts and abscesses, as well detoxifying the kidney and liver. 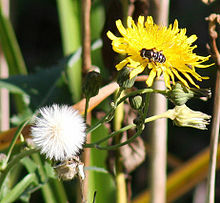 Taraxacum seeds are an important food source for certain birds. Dandelions are also important plants for Northern Hemisphere bees, providing an important source of nectar and pollen early in the season. Dandelions are used as food plants by the larvae of some species of Lepidoptera (butterflies and moths). They are also used as a source of nectar by the pearl-bordered fritillary (Boloria euphrosyne), one of the earliest emerging butterflies in the spring. With a wide range of uses, the dandelion is farmed in small gardens to massive farms. As well as being farmed primarily, it is kept as a companion plant; its taproot brings up nutrients for shallower-rooting plants, and adds minerals and nitrogen to soil; thus, it is also often added to lawn seed mixes. It is also known to attract pollinating insects and release ethylene gas, which helps fruit to ripen. Four dandelion flowers are the emblem of White Sulphur Springs, West Virginia. The citizens celebrate spring with an annual Dandelion Festival. 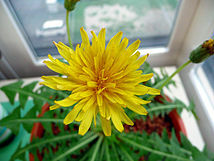 The dandelion is the official flower of the University of Rochester and "Dandelion Yellow" is one of the school's official colors. "The Dandelion Yellow" is an official University of Rochester song. Dandelion pollen may cause allergic reactions when eaten, or adverse skin reactions in sensitive individuals. Contact dermatitis after handling has also been reported, probably from the latex in the stems and leaves. [medical citation needed] Due to its high potassium level, dandelion can also increase the risk of hyperkalemia when taken with potassium-sparing diuretics. As the dandelion is commercially cultivated as food and as it is highly nutritious, wild-growing dandelions are more often than not considered a free food and a beneficial weed rather than a nuisance. However, for many commercial farmers of crops other than dandelions, they can cause significant economic damage because of their infestation in many crops worldwide; in some jurisdictions, the species T. officinale is listed as a noxious weed. Dandelions secrete latex when the tissues are cut or broken, yet in the wild type, the latex content is low and varies greatly. Using modern cultivation methods and optimization techniques, scientists in the Fraunhofer Institute for Molecular Biology and Applied Ecology (IME) in Germany developed a cultivar that is suitable for commercial production of natural rubber. The latex produced exhibits the same quality as the natural rubber from rubber trees. In collaboration with Continental AG, IME is building a pilot facility. As of May 2014[update], the first prototype test tires made with blends from dandelion-rubber are scheduled for testing on public roads over the next few years. In December 2017, Linglong Group Co. Ltd., a Chinese company, invested $450 million into making commercially viable rubber from dandelions. ^ Adrian John Richards (1985). "Sectional nomenclature in Taraxacum (Asteraceae)". Taxon. 34 (4): 633–644. doi:10.2307/1222201. JSTOR 1222201. ^ a b Luc Brouillet. "Taraxacum F. H. Wiggers, Prim. Fl. Holsat. 56. 1780". Flora of North America. ^ "Wild About Dandelions". Mother Earth News. ^ "Let dandelions grow. Bees, beetles and birds need them". The Guardian. ^ J. Doll & T. Trower. "Dandelion". WeedScience. University of Wisconsin. Archived from the original on 22 October 2008. ^ Stace, C. A. (2010). New Flora of the British Isles (Third ed.). Cambridge, U.K.: Cambridge University Press. p. 712. ISBN 9780521707725. ^ "blowball". McGraw-Hill Dictionary of Scientific & Technical Terms, 6E. The McGraw-Hill Companies, Inc. 2003. Retrieved 26 January 2013. ^ "dandelion clock - Definition from Longman English Dictionary Online". Jonas: Mosby's Dictionary of Complementary and Alternative Medicine. (c) 2005, Elsevier. Ldoceonline.com. Retrieved 3 July 2010. ^ Blamey, M.; Fitter, R.; Fitter, A (2003). Wild flowers of Britain and Ireland: The Complete Guide to the British and Irish Flora. London: A & C Black. p. 274. ISBN 978-1408179505. ^ a b A. J. Richards (1970). "Eutriploid facultative agamospermy in Taraxacum". New Phytologist. 69 (3): 761–774. doi:10.1111/j.1469-8137.1970.tb02461.x. JSTOR 2430530. ^ Richards, A.J. (1997). Dandelions of Great Britain and Ireland (Handbooks for Field Identification). Botanical Society of the British Isles Publications. p. 330. ISBN 978-0-901158-25-3. ^ Nowicki, Marcin; Zhao, Yichen; Boggess, Sarah L.; Fluess, Helge; Payá-Milans, Miriam; Staton, Margaret E.; Houston, Logan C.; Hadziabdic, Denita; Trigiano, Robert N. (13 February 2019). "Taraxacum kok-saghyz (rubber dandelion) genomic microsatellite loci reveal modest genetic diversity and cross-amplify broadly to related species". Scientific Reports. 9 (1): 1915. doi:10.1038/s41598-019-38532-8. ISSN 2045-2322. PMC 6374447. PMID 30760810. 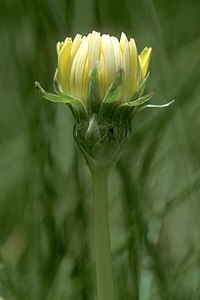 ^ "Alberta Biodiversity Monitoring Institute - Taraxacum ceratophorum". Archived from the original on 8 July 2014. Retrieved 29 August 2013. ^ "Flora of North America". Efloras.org. Retrieved 29 August 2012. ^ "Plants For A Future Search Error". www.ibiblio.org. Retrieved 17 April 2017. ^ "Dandelion". Fondation Louis Bonduelle. ^ "Gardening in Western Washington: Dandelions". Gardening.wsu.edu. 4 May 2003. Archived from the original on 26 June 2012. Retrieved 29 August 2012. ^ a b McGee, Harold (2004). "A survey of common vegetables". On Food and Cooking: the science and lore of the kitchen. New York: Scribner. p. 320. ISBN 978-0-684-80001-1. ^ Association, Maine Organic Farmers and Gardeners. "Dandelions". www.mofga.org. Retrieved 17 April 2017. ^ Jenkins, V. (2015). The lawn: a history of an American obsession. Smithsonian Institution. ^ Evans, C. L. (2002). The war on weeds in the Prairie west: an environmental history. University of Calgary Press. ^ Pieters, A. J. (1935). What is a Weed?. Agronomy Journal, 27(10), 781-783. ^ Barrett, S. H. (1983). Crop mimicry in weeds. Economic Botany, 37(3), 255-282. ^ Reported in An Etymological Dictionary of the English Language, by Walter W. Skeat (1888) (Downloadable at Archive.org). In An Etymology Dictionary of Modern English by Ernest Weekley (1921) it is reported that Arabic tarashaqun is derivable in turn from Persian talkh chakok, bitter herb (Downloadable at Archive.org). ^ Britton, N. F.; Brown, Addison (1970). An illustrated flora of the northern United States and Canada: from Newfoundland to the parallel of the southern boundary of Virginia, and from the Atlantic Ocean westward to the 102d meridian. New York: Dover Publications. p. 315. ISBN 978-0-486-22644-6. ^ "Common Dandelion_Family: Asteraceae" (PDF). ^ Loewer, Peter (2001). Solving weed problems. Guilford, Conn.: Lyons Press. p. 210. ISBN 978-1-58574-274-5. ^ Taylor, Joseph (1819). Antiquitates curiosae: the etymology of many remarkable old sayings, proverbs and singular customs explained by Joseph Taylor (2nd ed.). T&J Allman. p. 97. Retrieved 25 May 2010. ^ Anon. "Dandelion - far more than a weed" (PDF). Frapez.com. Frapez soothie spa. Retrieved 30 May 2010. ^ "Den virtuella floran: Taraxacum F. H. Wigg. - Maskrosor" (in Swedish). Linnaeus.nrm.se. Retrieved 3 July 2010. ^ Kleonikos G. Stavridakis; Κλεόνικος Γ. Σταυριδάκης (2006). Wild edible plants of Crete - Η Άγρια βρώσιμη χλωρίδα της Κρήτης. Rethymnon Crete. ISBN 978-960-631-179-6. ^ Castronovo Fusco, MA (15 April 2008). "Dandelion as underrated as underfoot". New Jersey On-Line. Retrieved 7 March 2011. ^ "Dandelion greens, raw". Nutritiondata.com. Retrieved 7 March 2011. ^ a b c d Katrin Schütz, Reinhold Carle & Andreas Schieber (2006). "Taraxacum—a review on its phytochemical and pharmacological profile". Journal of Ethnopharmacology. 107 (3): 313–323. doi:10.1016/j.jep.2006.07.021. PMID 16950583. ^ Pellett, Frank Chapman (1920). American Honey Plants; Together With Those Which Are of Special Value to the Beekeeper as Sources of Pollen. American Bee Journal Publication. p. 178. ISBN 978-1-152-86271-5. ^ Anon. "Companion Planting for Vegetables & Plants". Country living and farm lifestyles. countryfarm-lifestyles.com. Retrieved 7 March 2011. ^ "Welcome to Main Street White Sulphur Springs...Make it home". Wssmainstreet.org. Retrieved 3 July 2010. ^ "Songs of the University of Rochester". Lib.rochester.edu. 14 January 2010. Retrieved 3 July 2010. ^ a b Stewart-Wade, S. M.; Newmann, S.; Collins, L. L.; Boland, G. J. (2002). "The biology of Canadian weeds. 117. Taraxacum officinale G.H. Weber ex Wiggers". Canadian Journal of Plant Science. 82 (4): 825–853. doi:10.4141/P01-010. ^ J., Richardson (1 January 1985). "In praise of the archenemy". Audubon: 37–39. ISSN 0097-7136. ^ "Making Rubber from Dandelion Juice". Science Daily. 28 October 2013. Retrieved 22 November 2013. ^ "Fraunhofer and Continental come together when the dandelion rubber meets the road". 14 October 2013. Retrieved 14 December 2016. ^ "Linglong to fund research into dandelion rubber | Rubber and Plastics News". This page was last edited on 11 April 2019, at 20:57 (UTC).